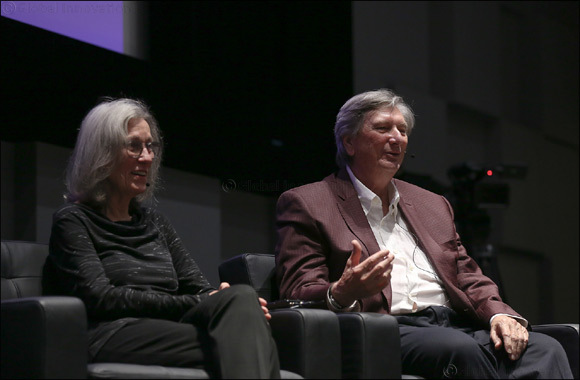 Doha, Qatar – April 10, 2019 – Taking a NU-Q audience on a journey through Hollywood history with examples from their own work, acclaimed cinematographer and director John Bailey and his wife, the award-winning film editor, Carol Littleton, focused much of a joint presentation on present and future filmmaking. Speaking to faculty, staff, and students at NU-Q, Bailey, who is also the president of the Academy of Motion Picture Arts and Sciences (Oscars), and Littleton noted that because it is cheaper to create content digitally today’s films have much more material for filmmakers to work with and has created new challenges. The conversation with Bailey and Littleton was moderated by NU-Q Dean Everette E. Dennis. “While drawing on decades of experience, some with the most iconic films of our time, Mr. Bailey and Ms. Littleton pointed to the changes in filmmaking brought about by the digital age, while also offering a gift for storytelling and film history that added a richness to their presentation and brought the history of Hollywood alive for our community,” Dennis said. During the session, the couple screened scenes from two of their films, Silverado (1985) and The Accidental Tourist (1988), and discussed the differences in approach – from building a suspenseful scene with American cowboys in the Wild West, to using close-up shots and warm lights to develop the ambience for characters in an intimate scene. The visit, which was organized in collaboration with Qatar Museums and Doha Film Institute, also allowed Mr. Bailey and Ms. Littleton to meet with faculty and students from NU-Q who were able to share their on-going and past projects with the guests. They also discussed film history, narrative development, and documentary film making. Bailey’s portfolio in film and documentary stretches far and wide, including scores of nominated and award-winning films like Mishima: A Life of Four Chapters (1985), The Sisterhood of Travelling Pants (2005), and License to Wed (2007). He is also a member of the American Society of Cinematographers, a cultural, educational, and professional organization dedicated to the advancement and progress of cinematography. Bailey earned his graduate degree at the University of Southern California in 1968. His most recent accomplishment was his election to the presidency of the Academy in 2017. Littleton, an Emmy Award recipient, has had a successful career in film editing and was elected as a member of the American Cinema Editors – an honorary society of film editors who are selected based on the quality of their film editing, their education, and their dedication to film editing. She was also a member of the Board of Governors of the Academy of Motion Picture Arts and Sciences from 1999-2002, and served as president of the Motion Picture Editors Guild during that late 1990s. Littleton’s work includes the infamous science fiction film, E.T. the Extra-Terrestrial (1982), which was written and directed by Steven Spielberg.